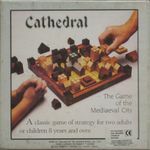 The front of the box of this edition of Cathedral is the same colour (red) as the Brightway Products edition, but otherwise has the same design as the (black) Family Games edition (with the coat of arms above the title). - The name of the publisher appears only on a small sticker on the back of the box. - The last page of the rules states that this is the 3rd edition (1985). - It has wooden pieces, and the light and dark pieces are identical (not mirror images, like in some other wooden editions).